Fonzi was my first. He’s responsible for the 360° turn my world took. Seriously, I owe him everything. 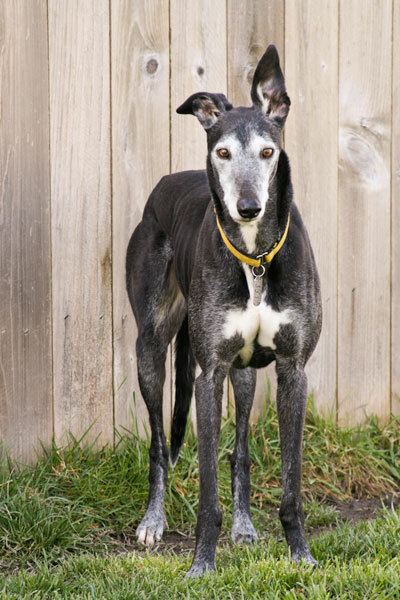 I really hadn’t planned on adopting a greyhound, I had a pair of Italian greyhounds. It was like the call of the wild. I just could not stop thinking about it. Things had to happen to adopt a greyhound, like my house had to be screened. I don’t think I ever cleaned so hard either before or since the scheduled day (and then something happened that they didn’t make it over that day), but I still picked out my greyhound. His kennel name was Greg. Greg, what kind of name for such a beautiful boy is that? He was so cool, he was without a doubt a Fonzarelli. He was pretty shy at first and petrified of white tile floors. Scatter rugs became my best friend and beach towels on the vet’s floor saved my back. Of course, the fact that I must have looked ridiculous was beside the point, Fonzi was much more comfortable. Fonzi taught us about clearing a room in 30 seconds or less. We eliminated chicken from his diet right away. Fonzi also defined sleep aggression. When he was wide awake, there was not a better hound, but disturb his beauty sleep… in the beginning, you might draw back a bloody stump. Definitely something we needed to work on. He had a way of tip toeing into bed when he thought we were asleep. We lost Fonzi to what the vet thinks was probably a spinal tumor. One week was all we got from the time his gate changed to not even being able to stand. My heart was broken. I never got to thank Fonzi for the new life he brought to me.